This is one of those throw it together recipes, using what is found, in the cupboard and refrigerator. As you may have noticed, I make many of these, and usually am pleasantly surprised by the good results. Three minutes before draining, add broccoli to the pot and finish cooking. You can also cook the broccoli separately or microwave it. Add the cheese and mix through the penne and broccoli. Add the apples and almonds and heat for another minute or two. I didn't add milk but I think a half cup of coconut milk would be a great addition. Add milk after the cheese and mix in. I love the simplicity of this pasta dish. Yum! 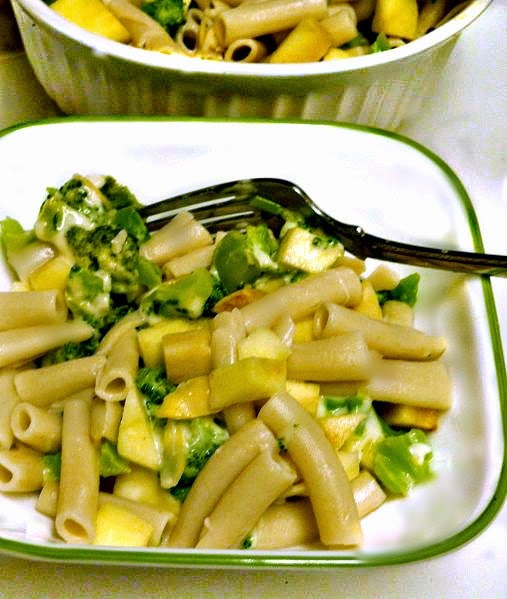 delicious pasta, thanks for sharing with Hearth and soul blog hop, pinning.